"A magical girl rational mystery." Tokyo is being attacked by monsters, but it is the appearance of three defenders with magical ability and a girlish theme that interests Sebastian. He is looking for an impressive project to leave the shadow of his overbearing and manipulative father, and this mystery presents an exceptional opportunity. Who are the magical girls? Whence come their abilities, and what does the existence of magic say about the world? Not to mention: why are they so reminiscent of a certain genre of Japanese fiction? Sebastian wants answers, and has a plan to extract them. He might be young, but he's armed with military hardware and professional training, while the magical girls let a knockoff supervillain monologue in the middle of combat. Can't be that tough. Pruning an Infinite Tree has not been tagged yet. Help others find Pruning an Infinite Tree by tagging it! 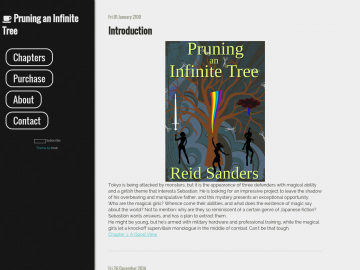 Pruning an Infinite Tree has not been reviewed yet. Pruning an Infinite Tree has not been recommended yet.